Macedonian Kingdom, Alexander the Great, 336 to 323 BC. 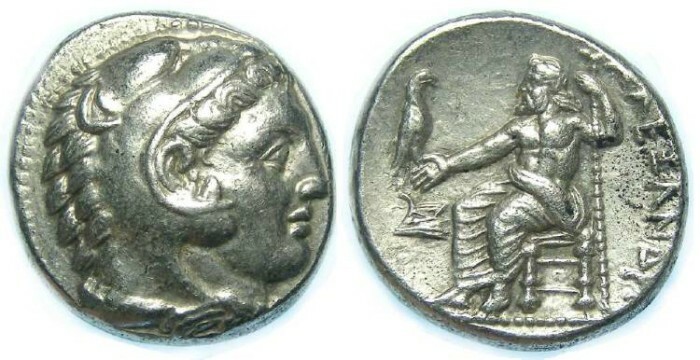 Silver tetradrachm. Lifetime issue. Date : ca. 332 to 326 BC. Reference : Price-4. Sear-6713 variety. Size : 23.1 x 24.9 mm. Weight : 17.10 grams. Grade : aXF. There is some very minor porosity on the right side of the obverse, but what you see on the image as black spots is very small raised bumps of black silver chloride which could easily be removed (I would have done so, but I did not notice them until I did the image). Reverse : Zeus seated left, holding a sceptre and eagle with a ship's prow below his arm, with ALEXANDROUto the right.